Stories of Impacted Food Service Workers, Bus Drivers. Mark Butler the Georgia Labor Commissioner recently decided to bar contracted workers such as food service workers and bus drivers at educational institutions from unemployment benefits when they are laid off over the summer and other school breaks. This came as a surprise for workers that have received these benefits for 16+ years. We are collecting stories from school workers to understand how this change will impact Georgia workers, their families and the children that depend on bus drivers and food service workers every day. Below, hear William Bradley, a community member and food service worker employed by food service provider Sodexo at Emory University in Atlanta, GA. William has worked at Emory University since September of 2000. 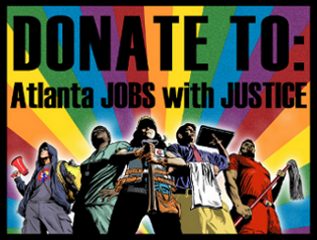 If you are being impacted by Mark Butler's decision to cut off basic unemployment benefits for bus drivers, food service workers and others and would like to share your story or your thoughts, please e-mail us at: admin@atlantajwj.org or call our office at 404-913-9595 to discuss your situation. We will be lifting up written testimonials as well as doing video interviews to demonstrate the broad and debilitating impact this change will have on our communities. And come out to the Summer Income for Everyone! Rally on June 1st at the Georgia Department of Labor (148 Andrew Young International Blvd NE Atlanta, GA) to send a message to Mark Butler that he needs to reverse his decision to bar school workers from income this summer. We need full and fair employment now. Let's Celebrate Our Victories, Build Relationships and Build Power. May Day rally with the Georgia Latino Alliance for Human Rights (GLAHR). Immigrants, trade unionists and students are pictured here sitting in silence reflecting on the moment together. HB-87, E-Verify, "Secure Communities" and 287 g programs are tearing families apart in our community. The community that we stand for welcomes our sisters and brothers with open arms. The community that we stand for understands that migration is not a choice but often an economic necessity - no one wants to leave their home. Our community stands for cultural understanding. Our community will stand united for the realization of our community.